Anthony Daasan – a voice that is as powerful as it is poetic; as soul stirring as it is down to earth; mesmerizing listeners with its beautiful simplicity and raw emotion. When IndiEarth collaborated with De Kulture to offer folk artists a stage at the Blue Lotus Festival, the chosen artist was this eclectic and spirited performer, from the southern reaches of Tamil Nadu. “I love my art, and this love and passion towards art – God gave me this gift”, says Anthony. His music – traditional folk music of Tamil Nadu – is a predominantly oral tradition, passed on from generation to generation – Anthony himself started learning at the age of ten. His music involves thunderous thappattam drums, the distinctly nasal wails of the nadaswaram, and Anthony himself singing, and playing a percussion instrument called the urumi – a traditional double headed folk drum of Tamil Nadu, often made of jackwood, and cow hide. “He’s very versatile, and highly talented”, says Sambhav Bohra, Festival Director of the Blue Lotus Festival, a festival with a truly eclectic and diverse line up of folk musicians, set in the equally magical town of Pushkar. The festival – which will unfold over the course of six days, between Feb 13th – 18th – will feature indigenous, devotional, tribal, and spiritual music, from various folk communities all across India. IndiEarth had the chance to catch up with Sambhav – a musician himself, and a classically trained pianist – about his vision for the festival, and for the future of folk music in India. 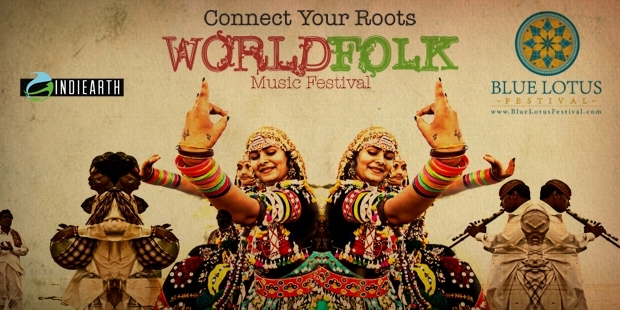 IndiEarth: What was your inspiration, behind organizing a folk festival of this magnitude? Sambhav: All our work started seven years ago, with the realization that we are heading towards a state of mono culture – in India, we have so much diversity – in art, music, food, culture – however, this “metro / urban culture” – or mono culture – is affecting India’s diversity, and poly culture. So we realized we needed to start initiatives like what we’re doing – to celebrate diversity in music. We have been traveling to villages, auditioning artists, recording them, promoting them through releasing albums under a record label – but, after a few years, we realized that artists need a better platform, and it is important they perform live. This creates a lasting impact on the audience to experience the performance in entirety. Hence, this festival is to bring all artists under one roof. IndiEarth: What is your personal connection with the folk music of India? Sambhav: I realized myself that while working/arranging/composing any music, it is a cumulative affect, of the lifestyle and influences you have had, growing up. Though it’s an expression, there is always a limitation as an artist, based on these limited experiences in one’s life. On the other hand, there is so much music that has been evolving over the centuries – and folk music, this is one genre, that has survived for centuries. In our generation, even if an album becomes a hit, after a few months it fades away, and people tend to forget about it – but folk music is something that lived through the ages – so there must be something there. This sort of music was not played traditionally for money – with folk music, artists do not perform for money, because they are not professionals as such – instead, they are performing for families, for themselves, as part of a ritual, or for god. In fact for most of these artists, music is not their primary occupation – many of them are cattle herders, or farmers. We have even had artists refuse to perform, saying “Why should we perform for you? We perform for Allah”. Since it is not for money, and without expectation, it’s music you yourself can truly identify with. IndiEarth: Can you tell me about funding, for a folk music festival like the Blue Lotus Festival? What are some challenges you faced? Sambhav: It is indeed a struggle as it is difficult to find partners because of the non-commercial nature of the music. So, we ourselves are producing and investing in this festival because of the conviction we have in this objective – we have been preparing for the festival for the past 1 year, working towards bringing artists and audiences together, from across villages and cities, to this festival. Now, we are looking forward to meeting audiences in Pushkar and seeing their response during the festival. IndiEarth: What would you like to see change, with respect to how folk music is funded, and promoted, in India? Sambhav: The primary objective has been, that we want people to listen to their own music, and appreciate it. This is only possible if you understand the music – the lyrical value, the melody. With folk music, and with monoculture creeping in (like Bollywood music, and pop music), other genres – like folk music – tend to get overshadowed. In India, I can say that the majority of music belongs to folk genre, but it is not being promoted, and shared. People don’t have access to folk music, so they cant appreciate it. I think it is high time that this music should be promoted through all platforms, and through all mediums possible. It is not like fast food – where this festival happens and suddenly, overnight, change happens – but I think it definitely is a starting point.